MAX EHRMAN AKA E.O.N.75 (EXTERMINATION OF NORMALITY) born 1975, IN THE SUNNY LITTLE BEACH TOWN OF NAPLES FLORIDA, FOUND THE WORLD OF ART IN HIS EARLY TWENTIES WHEN HE WAS LIVING IN GAINESVILLE FLORIDA WHILE ATTENDING THE UNIVERSITY OF FLORIDA. HAVING NEVER SEEN GRAFFITI ART IN HIS LIFE HE HAD NO UNDERSTANDING OF WHAT THE CULUTRE WAS OR EVEN WHAT THE MEDIUM OF SPRAY PAINT WAS OR WHAT THE CULTURE WAS ABOUT. ONE DAY A MURAL WAS PRODUCED ON A PUBLIC ART WALL IN GAINESVILLE. THIS EVENT CHANGED THE COARSE OF HIS LIFE AND CAREER. THREE GERMAN MURALISTS DID A MEMORIAL WALL TO A CHILD THAT DIED TRAGICALLY AT A YOUNG AGE. CONCEPTUALLY THE MURAL WAS BEYOND ANYTHING HE HAD EVER SEEN. THE LAYOUT, DESIGN, EXECUTION AND COLOR BALANCE WAS INCREDIBLE. THE NEXT DAY HE WENT TO HIS LOCAL PAIINT STORE, BOUGHT SPRAY PAINT AND WENT TO THE WALL, AND HASN’T STOPPED PAINTING EVER SINCE. SINCE THAT FIRST CHANCE ENCOUNTER MAX HAS EXCELLED AT THE ART FORM. HE MOVED TO EUROPE IN THE FALL OF 2001 AND STUDIED ARCHITECTURE AT THE DESSAU INSTITUTE OF ARCHITECTURE WHERE HE RECEIVED HIS MASTERS. WHILE IN EUROPE HE PAINTED IN 6 COUNTRIES AND SHOWED ARTWORK IN GALLERIES IN 4 COUNTRIES. AFTER COMING BACK TO THE U.S.A. HE HAS BEEN VERY BUSY.CURRENTLY LIVING IN SAN FRANCISCO HIS WORK HAS BEEN PUBLISHED INTERNATIONALLY AND NATIONALLY. EON75 HAS ALSO PRODUCED MURALS FOR THE CITY OF SAN FRANCISCO AND KNOWN MURALIST DOCUMANTARIAN JIM PRIGOFF. 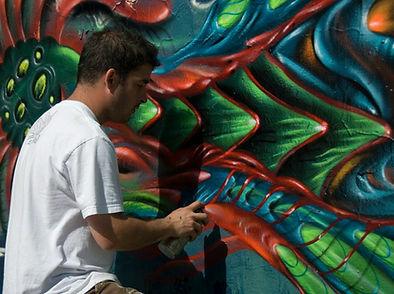 HE ALSO HAS PAINTED AT MANY FESTIVALS AND LIVE VENUES IN SAN FRANCSICO, FLORIDA, MIAMI AND NEW YORK CITY. E.O.N.75’S SIGNATURE STYLE DRAWS THE VIEWER IN WITH ITS ORGANIC FORMS AND COLOR HARMONY. COLOR HARMONY IS THE OVERAL BALANCE OF AN ARTWORK. THE VIEWERS EYE IS CARRIED ON A COSMIC JOURNEY THROUGH THE ARTWORK, AS A PIECE OR RED ON THE RIGHT IS JUXAPOTOSED BY A SMALL HINT OF RED ON THE LEFT. THIS NATURAL BALANCE CARRIES THE VIEWERS EYE THROUGHOUT THE WHOLE PAINTING WITHOUT THEM EVEN KNOWING IT. IN ESSENCSE YOU ARE ROMANCED AND DECIEVED BY THE COLOR AND IT CONTROLS YOUR VIEWING OF THE PAINTING. ONLY THROUGH HIS CONNECTION WITH NATURE COMBINED WITH A STRICT SCHOOLING IN ARCHITECTURE, AND ITS RIGOR, COULD THIS HARMONY AND PRECISION COME FORTH IN HIS PAINTINGS.